Every time I read a new book by Lani Lynn Vale I think “who am i going to fall in love with next?”, and while I’ve loved each and every one I’ve been introduced too, I think Bayou may have topped them all. Bayou (Benson) has Asperger’s but he does not let it run his life. Socially awkward as a kid, he worked hard to overcome his issues and is now the Warden of the prison after having left the army. The person who helped the most, though, was Phoebe, or who he likes to call, Fancy. Having met when they were young, she was one of the few people to care enough to talk to him and make him feel like a normal person and it made him want to overcome his short comings. When his cousin and her sister end up together, they reconnect, even though he tries not to. Phoebe isn’t having it though. She’s been in love with him since she was 15. He wasn’t going to get away that easily, even if she had to settle for a friendship. But when fate throws Bayou a curve and he ends up with a three year old daughter who is much like him, their relationship goes from zero to a hundred, and it’s her confidence in him that he can do anything that makes him stop fighting the feelings that he has. Isa is a special little girl and I couldn’t help but fall in love with her as much as Bayou. While she may not talk, her personality begins to shine thru as she connects with Bayou and Phoebe. Moments of her waking up abruptly, a little scowl on her, clutching a blankie, melt at the heart strings. The connection between Bayou and Phoebe is always there, even when they’re just friends. When he stops fighting, the attraction is off the charts! I was absolutely smitten by Bayou, the challenges he’s faced and overcome. I finished reading this book and immediately began rereading. I didn’t want it to end. 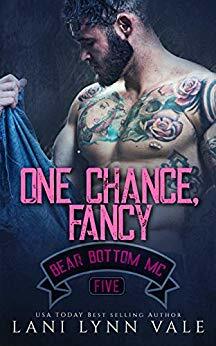 Lani Lynn Vale has such a talent for making her characters very real and have to overcome different problems while inserting lots of levity in every chapter. I am in love with her writing style and can’t wait for more.